By his incredible mistake, the Nazi-Soviet pact, Stalin caused the war. In fact Hitler himself didn't want a world war, but was aware he was running the risk of world war with the aggression against the Poland. Hitler's politics tactic was to seize the right moment to strike, sometime fronting high risks, but ever calculated. Never Hitler was before aware of risking the war like when he attacked Poland. But now, thanks to the Nazi-Soviet pact, he was free to run the maximum risk. With an hostile Russia, he never could run the risk of a great war. He couldn't do big moves. The Anglo-French were courting Stalin like Hitler, but they couldn't promise a free way in the east (Baltic States, Finland, Poland, Romenian Bucovina...) like Hitler cuold. But this price, at the moment, was good for Hitler, not for Stalin. The idea that Stalin wanted by this way to divert into the west or delay the nazi attack on Russia, doesn't hold: anybody knew that after the western powers, it would come the time of Russia. And was not a good idea to help the future enemy rather then the hated capitalist powers, if these last had to "divert or delay" the future enemy; but just for this. The sabotage of the war carried in France by the French Communist Party, following the Comintern orders, indicates that nor "diverting or delaying" was the point. So, accepting the Hitler's offers, in exchange of some territorial annexations, Stalin allowed Hitler to feel free at the shoulders, and starting (better: running the risk to start) the WWII. This fact was almost launching the Allies against Russia. The Anglo-French high command was thinking to a plan ("Catherine") to attack the Scandinavian peninsula, to stop the iron supply to the Germans and help Finland against Russia. Later anyway, remained only the idea of the invasion of Norway to stop the iron supply, anticipated by Germany. But another secret project was on way: the bombing of the Soviet oil wells in Caucaso, by 100 Anglo-French bombers taking off from Syria with the complicity of Turkey (that requested some guarantees that now we can omit). This bombing should be done in mid july 1940: the fall of France stopped everything. But this fact could have changed the history of WWII like we know it now. Anyway, coming back on Stalin guilt: your opinion. Hitler actualy didn't want a war with Wester alles, but he definitelly planned a big Crusade to the East( See "Main campf").He just dreamed the West support him against Russia. Yes, he was sure the British-French guaranties to Poles were phony. He hoped to capture the Poland without loud , just like he previously annexed the Austria and Chehoslovakia. What make us to think after the Pact the Hitler got the "frendly" USSR?Othervise he didn't ordered to develop Barbarossa in mid 1940, right after fall of France. Well actualy it was serious lack of Stalin. In the USSR it was not a secret the close war with Germany. However , Stalin hoped the Western front should tied the Germany for a enough long time. But after the extremaly quick collapse of France and escape of British troops out of Europe- it was clear the Stalin has made a mistake. And what was the point? Do you seriously think that the the members of Comintern ( most of whom were the Jews) burned by disare of sabotage against France fighting the Nazi Germany? Endeed it was the power that more persistly then anybody else care about resistence to Nazism. In Occuped France the Communist was the major anti-fascist power. Well if to be formally correct. Neither Hitler , nor Stalin has started the big war- it was Britain who declared war on Germany after attack of Poland.Althought it was PHONY war , but though.. Both the "help to finland" or the "bombing raids over Caucaus" were nothing but pure political phony proclamations.This meant declaration a war on USSR.It should mean ONLY one thing- the German-Soviet alliance. Do you seriously think the West was interested to provoke the USSR to join the Nazic Germany in war against Briatain/France? Hitler couldn't even dream about. Last edited by Nickdfresh; 09-24-2011 at 11:07 AM. ... I surely do not buy the premise of this thread at all. ..and the Myssoliny. Who folowing his agression plans to take controll all over Middle Sea had involved the Germany into war in Africa. Yes , of course. 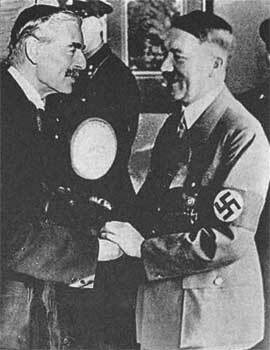 I mind the anglo-saxon as "West" whom Hitler considered as the "brothers nation" to Germans. The revenge to France and Poland for Dancig was in agenda from most beginning of Hitlers ideology.But all those "lacks" is nothing compared to the great mission of Germany,as Hitler believed - "the saving word from bolshevism".That's why we know manies in west looked at him as at great leader for a long time. The more I think of it, the less I seek answers concerning the "needs" of Hitler. What he really wanted and needed was a bed, veggie food, a place to p... and sh... and some entertainment. All the other things are about stumbling in his own pit, without realizing it was a pit because of the early succes. Very obvious for the born lunatic he was. I guess everyone was guilty in waging war. Stalin in particular was guilty of crimes even before the war. His black mark on history is rather different from discussing timelines of world war II as he falls in the category "killer of its own population". Last edited by steben; 09-26-2011 at 06:56 AM. Well, Hitler did declare war on the US after Pearl Harbor. So it's clearly America's fault for taking that seriously and getting involved in the European war when everyone could see that Germany wasn't in the least aggressive towards any other nation. Dude, the US with their "allies" waged a dozen of wars only in 20 centure , never even bordered a to "declare a war" to somebody.Did you once heard the US "declared war" to , say .. Vietnam or Iraq? Just send a bombers anywhere and - upps , we have a new war Usially it's very enough to declare the "possibility of use of MDW" by somebody. Even the Britain never care to declare war to Argentine for that damned islands Instead both have declared the ..intentions. Last edited by Chevan; 09-18-2013 at 01:13 PM. How , the Germans openly expressed the agressive to .."bolshevic" nation What seems makes him an sort of ally to western "democraties" in 1938 , didn't him? Last edited by Chevan; 09-19-2013 at 10:58 AM. How aggressive was he when Stalin signed the Nonaggression Pact with him? Glad to see you again, too, me old Russian mate. I suppose you've been busy working on the Lada while you've been away. Must take a lot of work to keep it on the road. What seems makes him an sort of ally to western "democraties" in 1938 , didn't him? It's an unfortunate fact that many people in Western Europe and in English speaking countries were sympathetic to Hitler, not least because of his anti-communist position. If Hitler had attacked the USSR first (leaving aside the problem of Poland being in the way), I doubt that there would have been much or even any support for the Soviets from the West. God , mate, the 6700 your posts here. You should be a general here I vote..
Last edited by Chevan; 09-19-2013 at 10:57 AM. and not least of his anti-semitism.Hitler never hided the fact he wanna draw the blood the Soviet jewry. I'm sure if even Hitler attacked it, the Poland should repat the role of Chehoslovakia - not a big sacrifice for a great role - the crusade to the east. Can do nothing- my heart belong to lada Never breaks actually- the construction seems too primitive to been broken anything.Shame to tell you, but i've bought the anothe car- Hundai And presented it to my misys..
Last edited by Chevan; 09-19-2013 at 10:59 AM.